As you probably know, my wife Kim suffers from arthritis. Before that time, I thought arthritis was something that only afflicted elderly people and could be dealt with by taking a simple pain killer. I was wrong! Today, 46 million people (one in five) suffer from the pain of arthritis in the United States alone. There are also 300,000 children who are affected by arthritis. It is likely you know people who suffer from arthritis. Arthritis also imposes a major burden on the economy. Costs to the U.S. economy totals $128 billion annually. 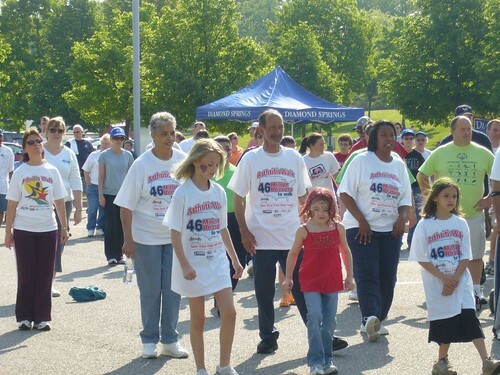 A week from today, Saturday, May 2nd, the Fredericksburg Arthritis Walk will be taking place. I am participating in the Arthritis Walk as a part of Let's Move Together, the Arthritis Foundation's nationwide movement that encourages people to move to prevent or treat arthritis. My fundraising goal this year is $1,000. I need your help. Please join me in this movement against arthritis by helping me reach my goal. Consider making a donation and sharing this opportunity with your friends. Donating provides you some great benefits. However, I want to give you an additional incentive that is unique and has some value to you and your business. For a donation of at least $40, I will write a website review here on the Everyday Giving Blog. Just email me (roger@everydaygiving.com) your website url and a keyword phrase to use for the review. The review will include an image of the website, a description, and two links (one with the keyword phrase and one with the url. The review will provide both links to your website and exposure of your website to the readers of the Everyday Giving Blog. All I ask is that you only submit a “family friendly” website for the review. If you don’t own a website of your own, consider submitting the website of your favorite charity. I will also submit a blog post each evening with the names of those who donate at http://www.EverydayGiving.com/arthritiswalk regardless of the amount. Remember, the walk is in one week. Thank you in advance for your support. I look forward to you joining me in the fight against arthritis. Students Helping Honduras is busy this Spring holding fundraising events across the country. I was able to attend one of the events this past weekend at the University of Mary Washington in Fredericksburg, Virginia. 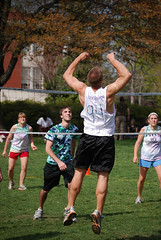 The fundraising event was a volleyball tournament. The funds raised through the event are going to be used to build a library at the village of Villa Soleada in El Progreso, Honduras. The facility, designed by engineers and architects from the Building Goodness Foundation, will give more than 2,000 people in the region a safe place to study and access books for the first time. The event had all of the elements to be successful. The elements included entertainment, food, team competition, great volunteers and fun. They also met their goal by raising more than $25,000. These students are making a difference in the lives of other people and in the life of a community. How are you making a difference? This is a Flickr badge showing items in a set called Students Helping Honduras Volleyball Fundraiser 2009. Make your own badge here. Are you a nonprofit board member or considering serving as a nonprofit board member in the future? That is great! Actively participating on a nonprofit board is a great way to make a difference. Christopher Scott from the Nonprofit Leadership, Innovation, and Change blog recently interviewed me regarding my board experience. Christopher asked some great questions to uncover reasons to be a board member and how your participation on a nonprofit board can be most effective. Click here to check out the interview. Enjoy the interview and be sure to leave Christopher a comment while you are there!